It's got diamonds, it's got Da Vinci - it must be Da Vinci Diamonds! 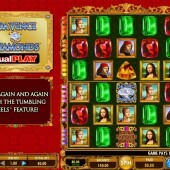 IGT's popular video slot Da Vinci Diamonds introduced the innovative 'Tumbling Reels' feature, where, much like in the popular Bejeweled slot, saw winning combos disappear from the reels, allowing other symbols to fall down and take their place. It led to more excitement, and more winnings! 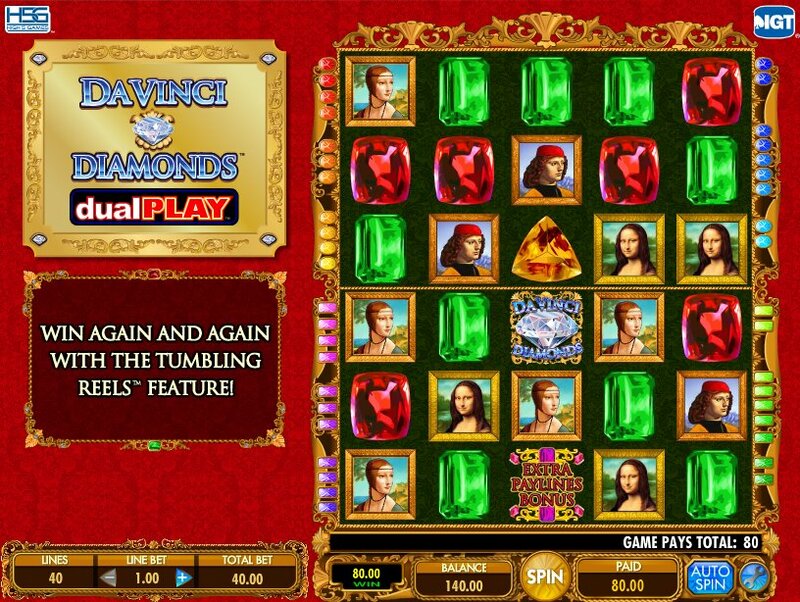 Leading slot developer IGT weren't content with the popularity of their first Renaissance-themed slot, and have come up with a 'Dual Play' version of the game. The big question fans of the first Da Vinci Diamonds will be asking is whether this is just a cheap follow-up or is this a slot to take seriously? Da Vinci Diamonds... but with Dual Play? So, what's Dual Play all about? Well, as it perhaps suggests, you don't play just one set of 5 reel games, you play two, one on top of each other. That means more play (40 paylines in total), more winning combos, and more tumbling reels. Not only that, but with the Dual Play game, IGT have added a new feature - Tumble Thru - whereby symbols from the top game tumble down and replace those unused images in the bottom game. Other than that, we have the familiar symbols from the original Da Vinci Diamonds game: emeralds, rubies and diamonds, the poker symbols, and plenty of Mona Lisas and other Da Vinci paintings. What with all the Tumbling this and Tumbling thats, it's easy to forget about Wilds. The 'Wild' symbol substitutes for everything other than the Bonus symbol. In the bonus's case, the 'Extra Pay-lines Bonus' symbol, when appearing on reels 1, 2 or 3 triggers 6 free spins. Not only that, 20 more pay-lines will become active on top of the 40 already in play. The free spins can be re-triggered, meaning that 300 free spins could potentially be won. You won't get many side games, progressive jackpots or animated buffalos hurtling towards you when you win, but that doesn't mean Da Vinci Diamonds Dual Play doesn't offer much. If free spins and big fun in the base game is more your thing, you'll love the dual nature of IGT's slot. We mentioned the addictive Bejeweled at the top of the review, and the good news is that IGT have released a slot based on the popular arcade game. Microgaming's chain reactor-themed slot, Bubble Bonanza, should also appeal to slots fans looking for something a little different.